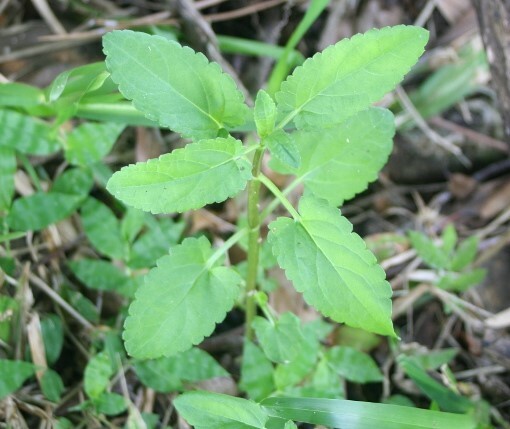 Figure 1: Chamberbitter, a common annual weed. Credit: Mary Salinas, UF/IFAS Extension Santa Rosa County. With daily rainfall occurring regularly, coupled with humid temperatures, summer annual weeds have had a mighty boost in growth. 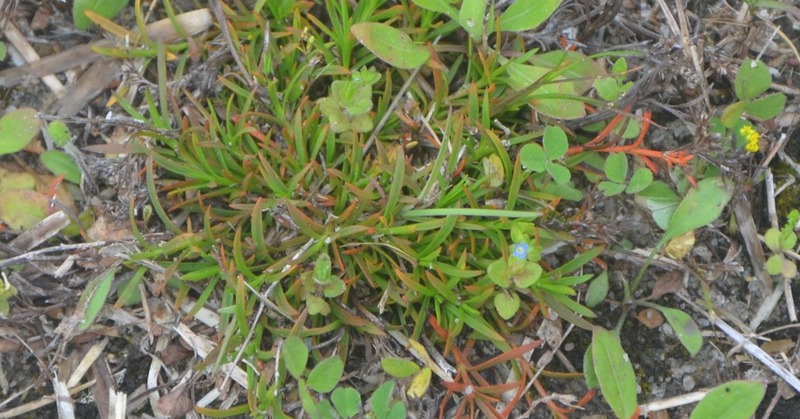 Chamberbitter, Florida pusley, sedge and oxalis are just some examples of the many weeds that are exploding across our landscape. 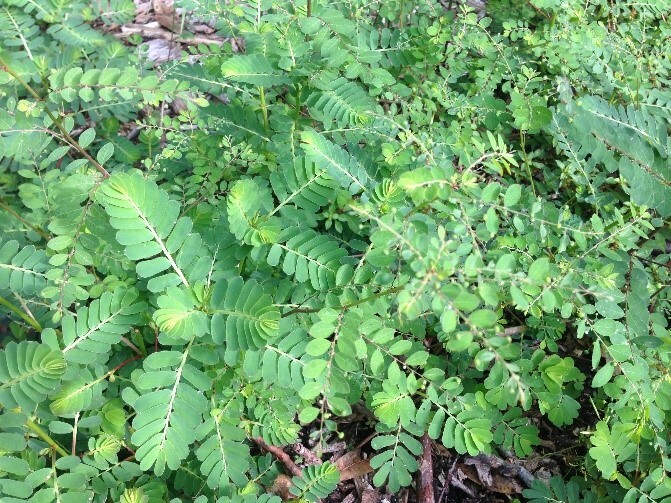 Chamberbitter (Phyllanthus urinaria) is found as north as Illinois and as west as Texas, but thrives in lower southeastern states. It’s a headache for homeowners as well as pasture managers. The foliage resembles that of the mimosa tree (Albizia julibrissin) and can be confused with the native mimosa groundcover, known as powderpuff mimosa (Mimosa strigillosa). This plant grows upright and develops a long taproot. Wart-like seeds can be found on the underside of the branch. Florida Pusley (Richardia scabra L.) also known as Florida snow or Mexican clover, has recently blanketed landscapes in the Panhandle with white flowers. It’s a persistent weed that moves quickly. Sedges and sedge-like plants (Cyperus ssp. ), known as kyllinga, are species that emerge in late spring and thrive in summer months in warm, moist climates. Excessive irrigation or areas with poor drainage create a very hospitable environment for these weeds. Sedges are annual grass-like plants have an elaborate flower-bearing stems. Yellow and purple nutsedge are the most common species. Kyllingas have smaller leaves and are less vertical. Sedges and kyllingas are fast spreading, and reproduce through seed and rhizomes, or underground tubers. Oxalis or yellow woodsorrel (Oxalis stricta) have heart-shaped lobes and have a bright yellow flower. Oxalis reproduces by seed and have a narrow “okra-like” seed pod. Figure 1: (L to R) Chamberbitter, Pusley, Sedge, Kyllinga & Oxalis. What about control? Some cultural control methods are hand removal and mowing frequently to offset the life cycle, but these practices alone will most likely not solve the problem. There are many broad spectrum herbicides that can be used to control these weeds with good results, but you must be persistent. Some are season long applied products. However, most effective products need to be applied in cooler temps than we have now. Consecutive days of temperatures of less than 90 degrees would be optimal. Applying the chemical otherwise will most likely harm the turfgrass. Be aware, some productions will injure or kill centipede and St. Augustine, but are safe to use on other turfgrasses like bermuda, bahia and zoysia. Be sure to read the label and follow the directions and precautions. Another option is non-selective herbicides, like glyphosate, which can be used in thick patches or for spot treatment. When using a selective herbicide, remember to protect turfgrass and other plants from spray drift or any contact, especially regarding ornamental plants and trees. Figure 1: Florida Betony, Stachys floridana. Credit: UF/IFAS Range Cattle Research & Education Center. 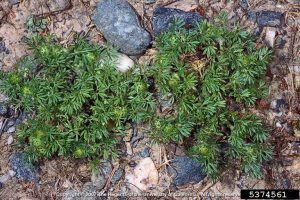 If you look closely at your yard, there is a good chance that you will find a plant that, depending on who you ask, is considered either a native wildflower or a weed and there are more than a few species that fit this description. If, upon even closer inspection, you find a plant with root tubers that resemble egg casings or even a rattlesnake’s rattle, you’ve stumbled upon Florida Betony. 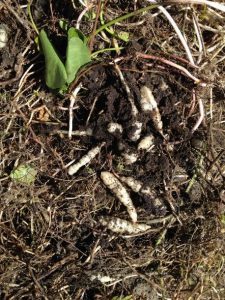 Stachys floridana is a perennial broadleaf commonly referred to as rattlesnake weed due to it’s fleshy, white, segmented underground tubers. The plant has an erect stem with leaves that are opposite, shovel-shaped and coarsely serrated. The plant structure is very similar to mint. Flowers, emerging in late spring, are pinkish-purple in color. These inflorescences will also produce fruit, consisting of four nutlets. However, reproduction of the plant and it’s propensity to spread through lawns and gardens primarily occurs through dense root tuber development. Florida Betony’s growing range was originally confined to the state of Florida, but the commercial nursery trade played a major hand in dispersing the plant across the Southeast in the mid-1900’s. It can now be found as far west as Texas and as far north as North Carolina. Figure 2: Tubers of the Florida Betony. Credit: Jill Bebee, UF/IFAS Gulf County Master Gardener.It can now be found as far west as Texas and as far north as North Carolina. This time of year is when Florida Betony thrives. The moderate temperatures of fall and spring are the prime growing periods for Betony. In the heat of the summer, the above-ground structure of the plant will struggle and often disappear completely, only to reemerge in the fall. As a lawn weed, managing tuber development is key to controlling this plant. Applying herbicide to the leaves and stalk may seem at first to have conquered the weed. However, in most cases the tuber will simply regenerate. Glyphosate (Roundup) can be used effectively for control in ornamental plant beds where no turf is present. Be careful when spraying herbicides around trees, shrubs and other desirable plants as any foliar contact will cause phytotoxicity. If you have an infestation of Florida Betony in your turfed areas, there are a few options for control. Regular applications of three way broadleaf herbicides, such as mixtures of 2-4D, Dicamba and Mecoprop, are effective at suppressing this pesky plant. For more information and options, please contact your local county extension office or see the supporting information links below. Always refer to the product label for specific uses, precautions and application rates when using any herbicide. Spring 2018 is barely out of the starting gate. All kinds of plants are sprouting and producing blooms! This week’s last gasp of winter temperatures slowed the progress, but only slightly. Much like the Easter egg hunts a few weeks ago, a search of the landscape can bring multiple surprises. Two colorful plants, spiderwort and rustweed, which are growing in the region fit into this category. Tradescantia ohiensis, the scientific name for spiderwort, is a herbaceous native plant. Its most striking feature which makes it easily identifiable is the cluster of bright purplish-blue blooms which are currently on display. The plant clumps are easily separated and transplanted. Spiderwort has been used in ornamental horticulture as a showy, low-cost alternative for many years. To learn more about weeds in north Florida, contact your local UF/IFAS County Extension Office. Click here for contact information. On the top of my list of lawn related annoyances is stepping into a patch of burweed, Soliva sessilis, which is in the sunflower family and is also known as spurweed. The leaves are opposite along the stem and sometimes resemble parsley. 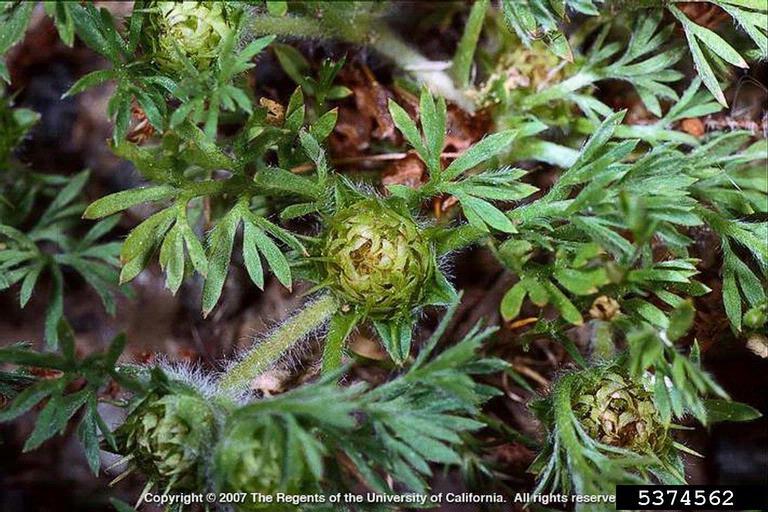 The main ways in which burweed can irk the casual gardener are sticking to socks, sneaking in with the dog, or littering flower beds with its nuisance. It can also hide in the house and reappear when shoes are removed. This causes pain in both the foot and the ear. Lawn burweed has been an especially noticeable problem in lawns. 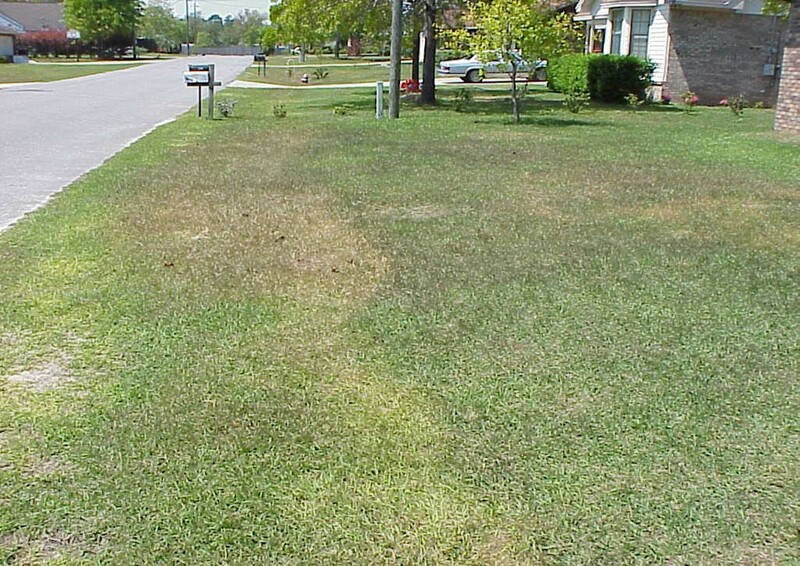 Over the years, extension offices throughout Northwest Florida have been fielding many questions and finding solutions to lawn burweed infestations! Maintaining a healthy vigorous lawn will prevent weeds from taking over. If your lawn is reasonably healthy and only a few instances of this weed exist, try to mechanically remove them and encourage the lawn to outgrow them. If an infestation of burweed occurred last year on a specific patch of turf, take note. The best time to apply pre-emergent herbicides to control burweed is in October, when nighttime temperatures drop to between 55-60 degrees F for a few consecutive nights. A widely used pre-emergence product for burweed control is isoxaben, which is sold under the brand name of Gallery as well as others. It prevents the weed from emerging from the ground when it germinates and can be used on St. Augustine, centipede, bahia and zoysia lawns, as well as in ornamental shrub beds. In northwest Florida, this herbicide needs to be applied in October for best results. A second application later in the season might be warranted. For more information about control, please consult this excellent article on lawn burweed management. Now is the time to control burweed before it gets started. As temperatures cool burweed seed will germinate, as it is a winter annual. In cases where it is already coming up, control with post-emergent herbicide may be warranted. The active ingredients mentioned above are present in a variety of ‘trade name’ products* available from your local garden center, farm supply or co-op. Be sure to read label instructions carefully and contact your local extension office for any assistance. 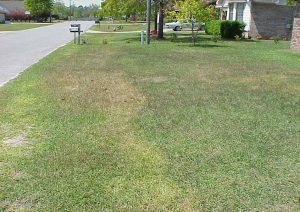 I hope all the northwest Florida lawn managers prevent burweed this fall so that lawns will be burweed free next spring.